I love photopolymer intaglio and I love teaching, so guiding people through the intricacies and opportunities of photo-based printmaking processes is pure joy for me. 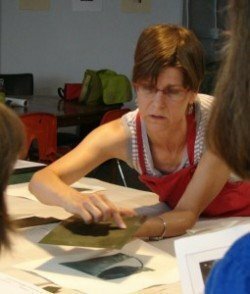 I’m interested in listening to what you want, or your uncertainties about what you want, and working intently to find what in printmaking excites you and how your work can best be developed and you can flourish. I’m interested in working with individuals who want to focus exclusively on technical/skill development and troubleshooting, as well as with individuals who want feedback on all aspects of their work: the content, the expression, the visual elements, and the process. I’d also enjoy working with people who want an introduction to or just need help with Adobe Photoshop.